Young played in 41 games at Notre Dame, started 30 of them, and was credited with 176 tackles and 18 sacks. He received first-team All-American recognition in 1993 from the American Football Coaches Assn. and was chosen by the 49ers in the first round of the ’94 NFL draft (seventh overall). Young moved directly into the starting lineup and teamed well with second-year DT Dana Stubblefield to solidify the middle of the defensive line. 49ers went 13-3 to finish first in the NFC West with the conference’s best record. Won NFC Divisional playoff over Chicago Bears (44-15), NFC Championship over Dallas Cowboys (38-28), and Super Bowl over San Diego Chargers (49-26). Young lost four games to an ankle injury in 1995, but bounced back in ’96 to record a career-high 11.5 sacks and receive consensus first-team All-NFL and Pro Bowl recognition. Fast, strong, and with great skill, he went on to become a fixture on San Francisco’s defensive line for a total of 14 seasons. Injuries cost Young time in 1997 and ’98, including a broken leg that required the insertion of a metal rod, but he bounced back in 1999 to return to the Pro Bowl and received NFL Comeback Player of the Year honors as well as 2nd-team All-NFL recognition from the Associated Press. He was selected to the Pro Bowl again in 2001 and ’02. Young was an outstanding team leader who was recognized for his professionalism and sportsmanship. He was shifted to defensive end in 2005, where he remained for his last three seasons. 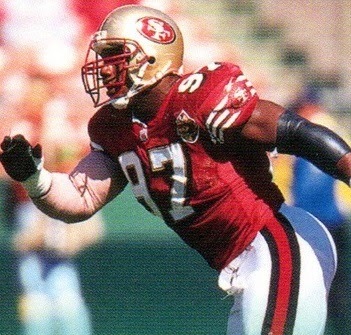 Upon his retirement following the ’07 season, he had played in 208 games, all with San Francisco, and recorded 89.5 sacks, making him the franchise’s career leader. He received first- or second-team All-NFL recognition after four seasons and was chosen to the Pro Bowl four times as well.